Is the price $60 per module or $60 to do any/all of the modules? The fee of $60 supplies you with a registration to log in and do any of the modules you like. You can do just the mandatory module, or you can do the mandatory module plus all of the other 22 modules if you like. All for the one fee of $60. Can I just do the module I want to do, or do I have to do the mandatory module as well? No. The mandatory module provides a very good understanding of sleep and how important it is. When you understand this, you are then in the best position to fully understand all of the contents of any other module. The information in the mandatory module is very important. What experience has the module developer got? The developer of the training modules has over 21 years experience in sleep and fatigue management. Each of the modules relating to an occupation was discussed with personnel from the respective industry. This is crucial in getting the information right. Can I stop part-way through a training module? If you are watching a training video and feel you need a break, simply pause it and go back to it later. If you have to stop the video completely, you can open the video at a later stage (next day or a week later) and go over the video again or move the slide bar until you get to the point where you stopped it. Until you have completed all quiz questions correctly for the module, you can pause, stop and re-start whenever you wish. Is there a set time that I have to complete the training? No there isn’t. You can take a day, a week or a month if you wish. The training is not finished until you have printed out your certificate. At that point, you will be logged out and will need another subscription to do more modules. How do I know which modules I have completed? When you have completed a module, the bar at the bottom of the module picture will turn from red to green. When the bar is green, you have completed the module and cannot open it again. Note that the first two modules are completed and the next two are not. 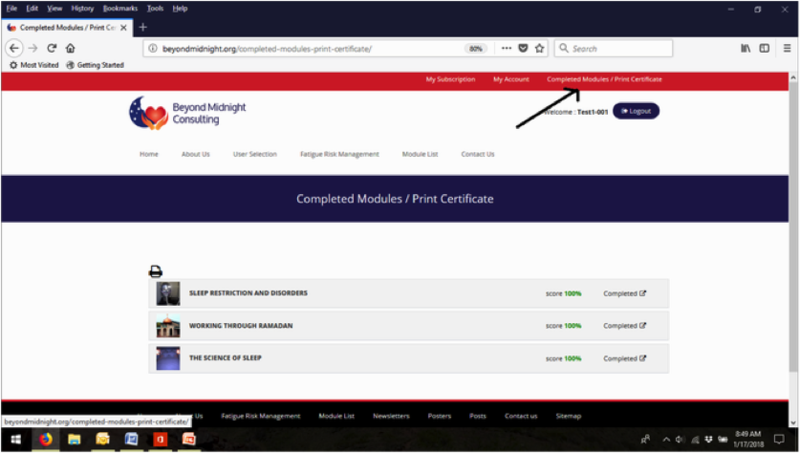 You can check the progress of your completed modules and when you have all of the modules that you need completed, go to “Completed modules/Print Certificate” and you will see a list of the completed modules. Can I download a certificate? Yes. When you print the certificate it is available to download. You can then save it to your device and email it to a training department or employer if this is required. If I get some of the quiz questions wrong, can I re-test? Yes. If you get any questions wrong, it will be shown on the screen. You can scroll through the questions to see which one is wrong. You can then restart the video and scroll to where the information on the question is, or watch the whole video again if you like. You can then do the quiz questions again until you get them all correct. I’m a truck driver, can I do the TLIF 2010a or TLIF 3063a accredited training online? What modules are recommended? Is there a recommended module list for different occupations? Beyond Midnight Consulting. All Rights Reserved.